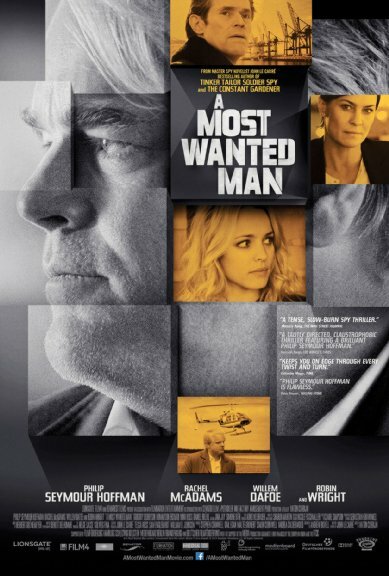 Earlier this week I returned to the State Theatre to catch current release A Most Wanted Man, which is notable, in an unfortunate and unforeseen (of course) way, for offering the last starring role of Philip Seymour Hoffman. The stars promoted the film at Sundance earlier this year, just a few short weeks before Hoffman’s sad and widely – covered in the media death. The film proceeded with its release, though it’s unclear to me how large of a rollout it will get. The movie is not the action packed drama teased in the trailer, but instead takes a more thoughtful and process – oriented approach to its storyline. Eventually the events proceed in a manner similar to, but not quite as stylistically pleasing as, the adaption of Tinker Tailor Soldier Spy, written by the same author. This film lacks a compelling narrative structure that has made some of the author’s other works, most notably The Constant Gardener, more memorable in their cinematic adaptations. Nonetheless, the story remains timely and topical. Hoffman takes the central role as Günther Bachmann, head of a Hamburg, Germany based spying agency. Bachmann and his associates, which include character actor Daniel Bruhl, are charged with monitoring a Chechen immigrant who has recently arrived in Germany via illegal means. The immigrant, Issa, has business he wants to attend to with a local banker (Willem Defoe) while his situation attracts the attention of a young lawyer played by Rachel McAdams. Meanwhile, Gunther deals with increasing tensions between himself and fellow CIA/Stasi-type operatives, including an American representative played by Robin Wright. While it’s great that Wright’s involvement with House of Cards has given her a reinvigorated career profile, her role here seems too similar to that show, and it feels like her distracting brunette bob was an afterthought attempt by the producers to further differentiate her character. The “and” credit before her name is a further giveaway that her role will not be central to the plot but will come in at a few key scenes. As for the rest of the cast, the marquee names acquit themselves well. Dafoe offers a tonal opposite from his role in The Grand Budapest Hotel earlier this year, and where he’s someone I often think of as playing villainous or “heavy” type characters, this role’s emphasis on uncertainty and more emotional angles seemed to be a refreshing change of pace. McAdams doesn’t seem to have aged at all since her initial breakthrough roles 10 years ago (!) and presents a mostly-convincing German accent for her scenes. Her infectious smile and good humor, widely used in other films, are rarely seen here. The film’s problem lies in its lack of a compelling storyline. And while Issa ultimately becomes the central character, the “most wanted man,” the character is seen almost completely in solemn, very serious scenes, and given little room to grow or develop empathy with the viewer, which may be a joint fault between the writer and the performer. The situation with Issa is established with urgency, and there is a strong opening sequence establishing the character’s arrival in Hamburg, the security presence in the city, and why the characters might be interested in following Issa. But things slow waaaay down after that, and it’s difficult to sustain interest in what the story holds for the characters. However, some twists and turns involving the lawyer, and who knows what in relation to whom, ultimately manage to keep things interesting. The film is drenched in ominous colors of grey, black and steel. As I noted above, the characters rarely break a smile. There is an intriguing balance of power constantly shifting and changing gears in the story. But the film as a whole has to be one that you are in the mood for, with lots of gloom and seriousness and definitely not a choice for a light night out. Posted on August 1, 2014, in Movies and tagged ann arbor, john lecarre, movies, philip seymour hoffman, rachel mcadams, robin wright, willem dafoe. Bookmark the permalink. 1 Comment.